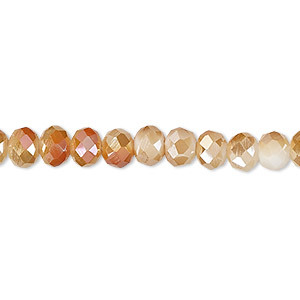 Bead, Celestial Crystal®, 48-facet, opaque orange with half-coat smoky AB, 6x4mm faceted rondelle. Sold per 15-1/2" to 16" strand, approximately 100 beads. Item Number: H20-A1397GL Have a question about this item? These orange Celestial Crystal® beads are gleaming with a half-coat of smoky AB finish. 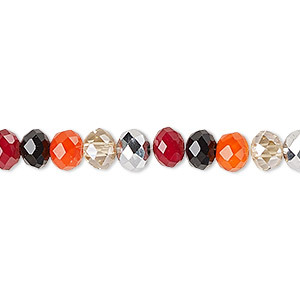 Bead, Celestial Crystal®, 48-facet, opaque orange with half-coat smoky AB, 10x8mm faceted rondelle. Sold per 15-1/2" to 16" strand, approximately 40 beads. 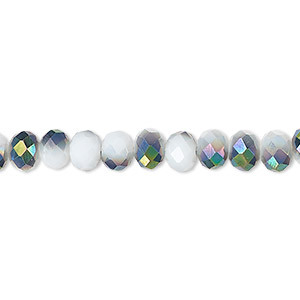 Bead, Celestial Crystal®, 48-facet, opaque white with half-coat metallic green, 6x4mm faceted rondelle. Sold per 15-1/2" to 16" strand, approximately 100 beads. 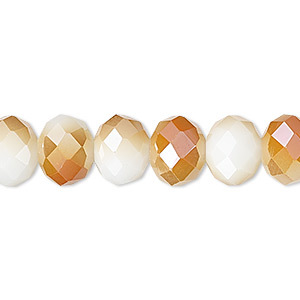 Bead, Celestial Crystal®, 48-facet, opaque white with half-coat orange AB, 6x4mm faceted rondelle. Sold per 15-1/2" to 16" strand, approximately 100 beads. 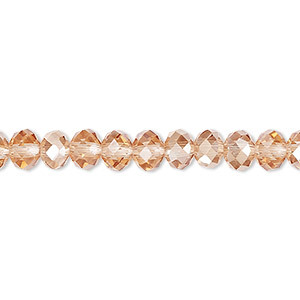 Bead, Celestial Crystal®, 48-facet, transparent light pink with half-coat light citrine, 6x4mm faceted rondelle. Sold per 15-1/2" to 16" strand, approximately 100 beads. 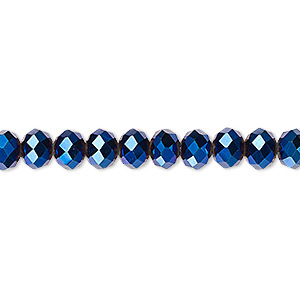 Bead, Celestial Crystal®, 48-facet, opaque metallic cobalt, 6x4mm faceted rondelle. Sold per 15-1/2" to 16" strand, approximately 100 beads. 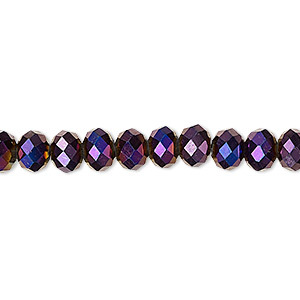 Bead, Celestial Crystal®, 48-facet, opaque metallic purple, 6x4mm faceted rondelle. Sold per 15-1/2" to 16" strand, approximately 100 beads. 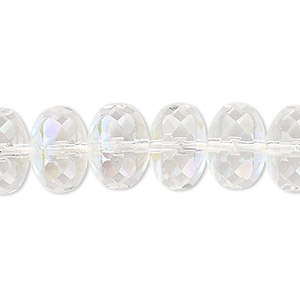 Bead, Celestial Crystal®, 48-facet, opaque white with half-coat orange AB, 10x8mm faceted rondelle. Sold per 15-1/2" to 16" strand, approximately 40 beads. 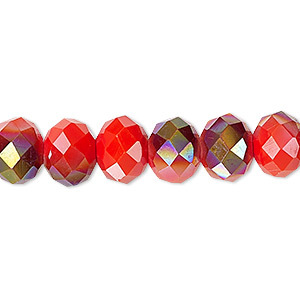 Bead, Celestial Crystal®, berries, 6x4mm faceted rondelle. Sold per 15-1/2" to 16" strand, approximately 100 beads. 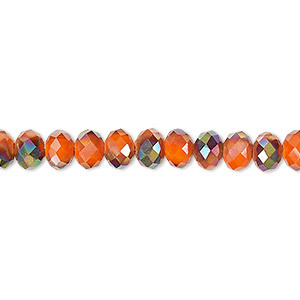 Bead, crystal, opaque orange AB, 8mm faceted bicone. Sold per 15-1/2" to 16" strand.